The frame of this narrow building slotted into the space between a pair of high-rise blocks was adapted by South Korean architect Moon Hoon to function as an urban greenhouse that will eventually be filled with plants. Known as the SAI Project, the five-storey-high structure occupies the steel frame of a Seoul building that was left half finished, after the clients were forced to abandon their original design at the last minute. Rather than waste the existing structure, they commissioned Moon Hoon to adapt the steel framework for a new use. "The metal structure of the building had already reached completion, and the husband and wife that had commissioned the project dreamed of a resting space full of greens," said Moon. The architect – who was also one of the contributors to the Golden Lion-winning Korean Pavilion at this year's Venice Biennale – introduced a grating of fibreglass reinforced plastic (FRP) to the framework, providing walls, floors and ceilings. This material allows more than 50 per cent of daylight to permeate through the facade to the interior, creating a sheltered but light-filled environment suited to growing plants. Rather than following the floor levels dictated by the frame, Moon used steel cables to support a system of split-level storeys, which include a generous ground floor, a first-floor mezzanine and three non-uniform upper levels. "I opted to suspend each part by connecting it via a cable to the structure above, and formed a haphazard grid of various sizes that did not match the steel frames of the building," he said. One side of the building is left open, as it bounded by the glass wall of the adjacent building – an office block for Mary Kay cosmetics. 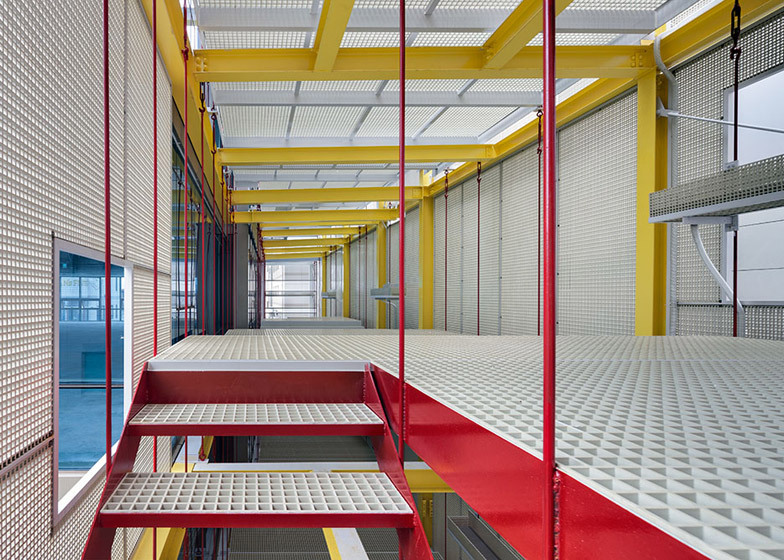 A vivid shade of yellow was added to the original steelwork, giving a gridded appearance to the space, while the staircases and steel cables are picked out in a deep shade of red. Windows of different shapes and sizes puncture the walls and additional wall fixings offer places where hanging plants can be added. "Like monkeys in the jungle, I imagine the space to be a place of comfort and fun, for those people who may seek rest in the building," added Moon.